Queen’s University in Belfast has said a conference to discuss the aftermath of the Charlie Hebdo murders in France will now go ahead following a risk assessment. When news of the cancellation broke last month, it was revealed that the University’s vice-chancellor, Patrick Johnston, cancelled the event last month because of the security risk and concerns for the university’s reputation. This decision was significantly criticised by journalists’, poets, academics and intellectuals who were due to attend the conference in June. However, on 1 May Queen’s said that following the completion of a risk assessment, the event would now take place as scheduled. The University insisted the issue was not related to “academic freedom” when it announced that the risk assessment had been completed and the event would now go ahead. Several Belfast-based writers claimed the university was worried about deterring prospective students and jeopardising potential investment from parts of the Islamic world, especially the oil-rich Gulf states. Max Silverman, professor of Modern French Studies at the University of Leeds, is due to speak at the event. The academic, who had been critical of the original decision to cancel, welcomed the change of stance. 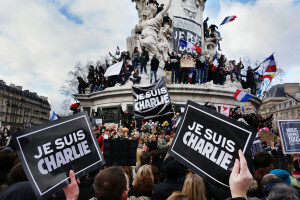 Nearly five months after the attack, Charlie Hebdo remains a source of controversy. Last month, 26 writers including Joyce Carol Oates and Michael Ondaatje joined a protest against giving the magazine a freedom of expression award. Novelist Salman Rushdie defended international writers’ organisation PEN for presenting its Free Expression Courage award to the French magazine and criticised writers who objected to it of racism. “The Charlie Hebdo artists were executed in cold blood for drawing satirical cartoons, which is an entirely legitimate activity.